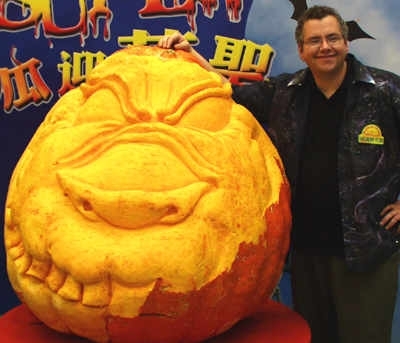 Patrick James Moser, the world's greatest giant pumpkin carver and boy genius, has left this world a better place. Patrick, who loved learning and science, and valued knowledge above all things, passed this morning, August 7, 2010, at Hamot Medical Center in Erie, following cardiac surgery on Thursday. He was 42 years, 10 months and 32 days old. Patrick was an amazing individual, loved dearly by those who understood him. He felt love and giving of love was one of his main purposes in life. He spent countless hours pouring love into multiple things, including his family, friends, his plants, yard and all things scientific. Patrick's main spiritual belief was joyism, Joy is where you find it. He felt that looking above his life circumstances and finding the goodness in all things, was what life was all about. Before his early retirement, due to a disability that was created by MS, he was a graphic designer and had formed Interlattice Inc. in the early 1990s. He wrote code and developed some of the most amazing graphical images and web pages. He sold the business when he was too unwell to work. He will be dearly missed by his twin sister, Patricia Coates of Chinle, Ariz., who loved him as much as life and was his most favorite playmate. He also will be missed by his sister, Michelle Anderson of Ashville, N.Y., and brothers Rick Moser of Harford, Pa., and Thomas Moser of Jamestown, N.Y., along his many nieces and nephews. His father, James Moser of Canisteo, N.Y., will miss his amazing engineering powers. In turn may we all be jolly. Feel free to visit Grumpkins.com to see Patrick's web page. Please join us on Monday, August 9, 2010, at the Lind Funeral Home in Jamestown for a memorial service at 11:11 a.m. Viewing will be from 9:30 to 11 a.m. on the same day. You may light a candle in remembrance of www.lindfuneralhome.com. Along with a Memorial Gallery that you can both browse and contribute to, there are also some links shared below for your joy! Welcome to the World of Grumpkins the home of Patrick Moser's amazing Halloween creations! For 21 years I have been taking the traditional Jack O' Lantern a step further with hundreds of hours spent with thousands of pounds of pumpkins. Over that time my craft has evolved from mere carving to sculpting, and the fruits themselves from mere pumpkins into Grumpkins! Grumpkins© 2007 Images and text contained in this site are the property of Patrick Moser.